The U.S. Department of State has proposed new Federal Rules which could severely restrict the exchange of information about firearms, gunsmithing, and reloading on websites and in internet forums. Draconian penalties could be imposed on websites such as AccurateShooter.com. Restrictions on dissemination of “technical data” could impact reloading forums, and perhaps even block the publishing of gunsmithing information in print and on the internet. Read Summary of Proposed Rule and/or SUBMIT COMMENT HERE. Steve Johnson, Editor of The Firearm Blog (TFB), writes: “The State Department is considering expanding rules to prevent U.S. manufacturers, or U.S. citizens, from publishing unclassified technical information relating to the manufacture of any weapons, including firearms and ammunition. If the information is distributed in any way that a non-citizen could access it (which essentially means any transmission of the information to the general public even if the information never leaves the USA) it would need to be first cleared first by the State Department. Publishing includes, but [is] not limited to, blog posts, posting comments on blogs, gun forums, in books, on DVDs and on Youtube. This could spell the end of TFB, other non-political guns blogs, reduce the type of content gun magazines would publish, [and] prevent the publication of books on gunsmithing[. ]” Read TFB Article. 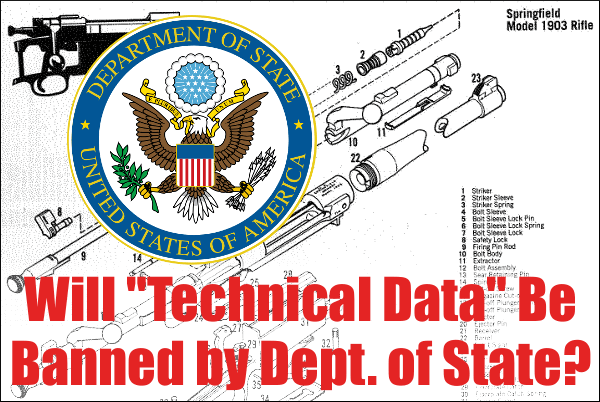 Share the post "U.S. State Department Seeks to Restrict Firearms “Technical Data”"